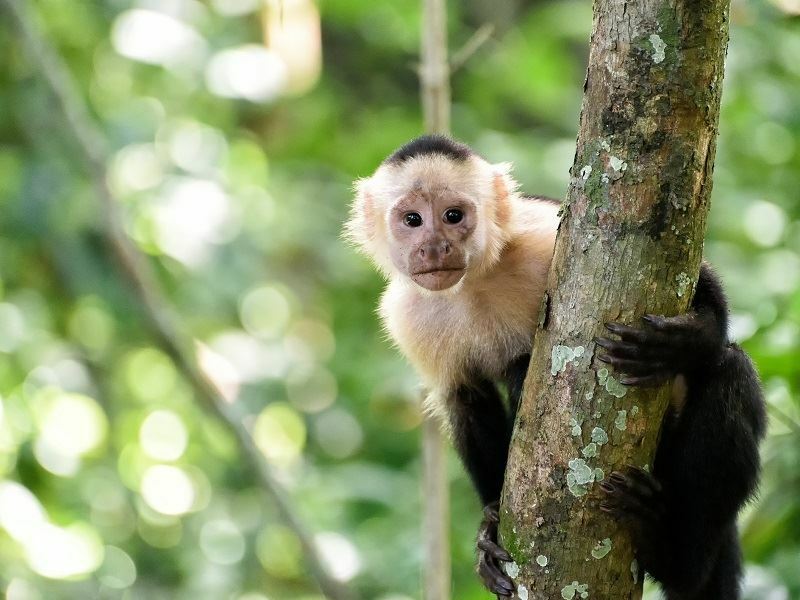 For the ultimate in back to nature experiences, there’s nowhere quite like Costa Rica. This little country lies between the Pacific Ocean and the Caribbean Sea and is one of the most bio-diverse countries in the world, providing many opportunities to see brightly coloured birds, monkeys, butterflies, sloth and red-eyed tree frogs among its 26 national parks. Perfect for adventure seekers, honeymooners and anyone looking for an abundance of natural wonders and heavenly beaches. Pick your luxurious beach resort on your preferred coastline, head inland for stunningly located eco-lodges or book an escorted tour to see more of the island. 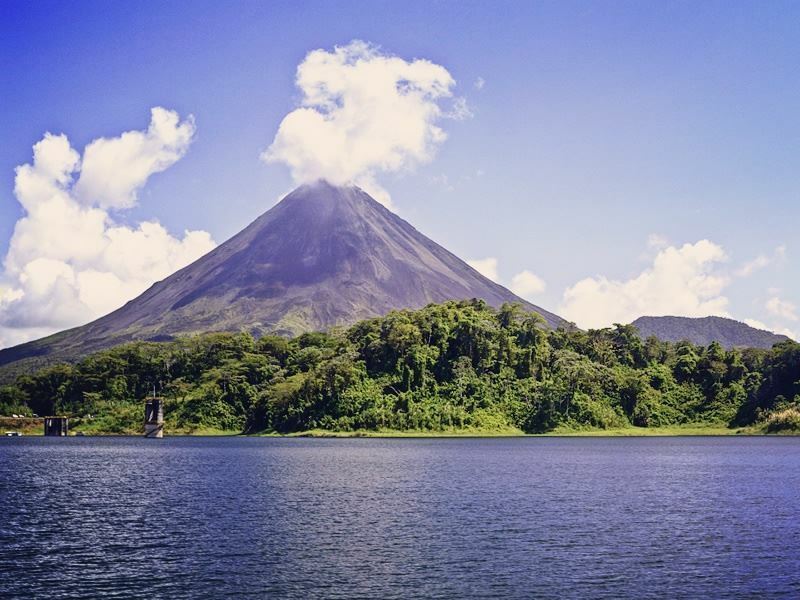 Explore the tranquil cloudforest, visit the Arenal Volcano and combine your visits to national parks with exhilarating outdoor activities. 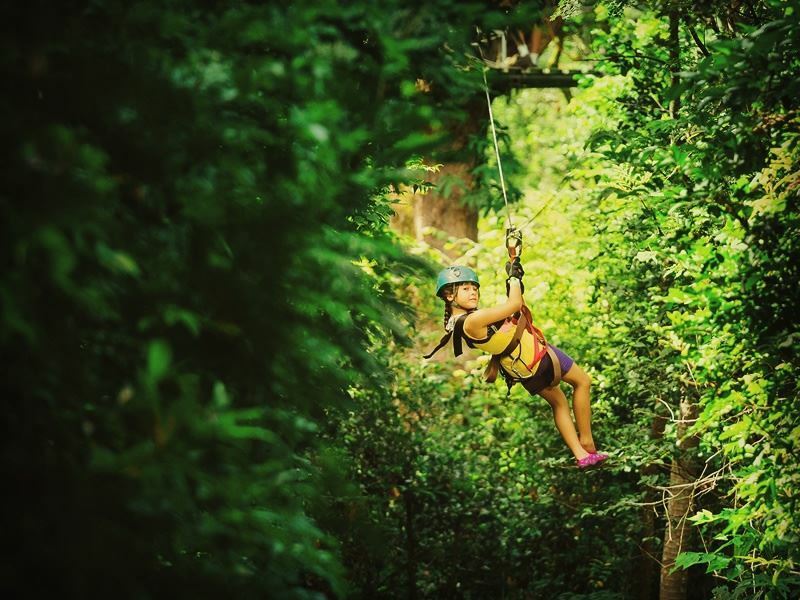 From zip lining high above the forest canopy to river rafting – there are activities to suit all ages and fitness levels. You can float gently down a river, taking in the sights and sounds of the jungle or go for something with more of an adrenaline rush. Soak in hot springs, go horse riding, take guided walks or just relax on the sublime beaches. For more information on when and where to go in Costa Rica, carry on reading our Beginners Guide, with lots of practical information to get your adventures in Costa Rica off to a good start. If you’re planning a beach holiday and looking for plenty of sunshine and less rain, Costa Rica is best visited in the dry season. However, it does rather depend on which coast you’re going to and what you plan to do (see below). 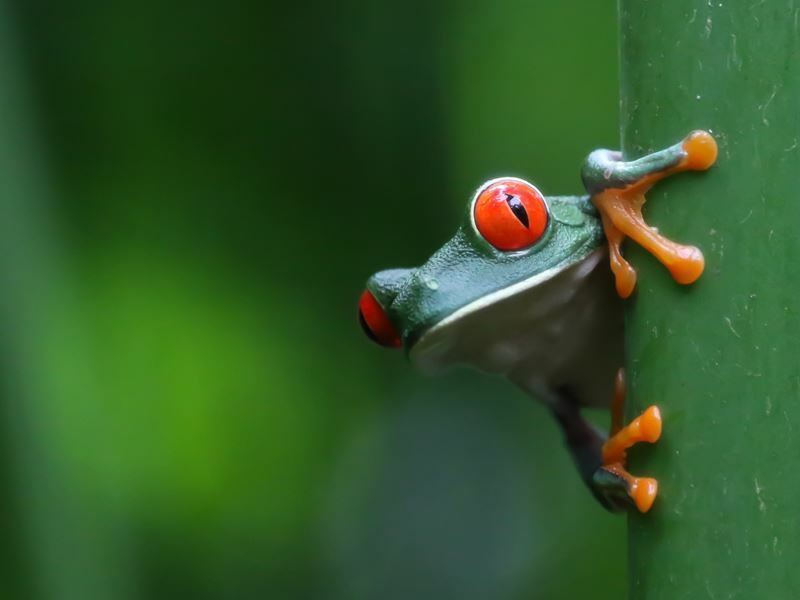 If you’re heading to Monteverde Cloud Forest for some rainforest trekking and enjoy the unique flora and fauna – then don’t discount the rain season. May to November is quieter, cheaper and the countryside is at its most verdant. Make sure you have suitable footwear for walking, long trousers and ideally a sweatshirt for the cooler mountain temperatures. A light rain jacket and some insect repellent will come in handy too. 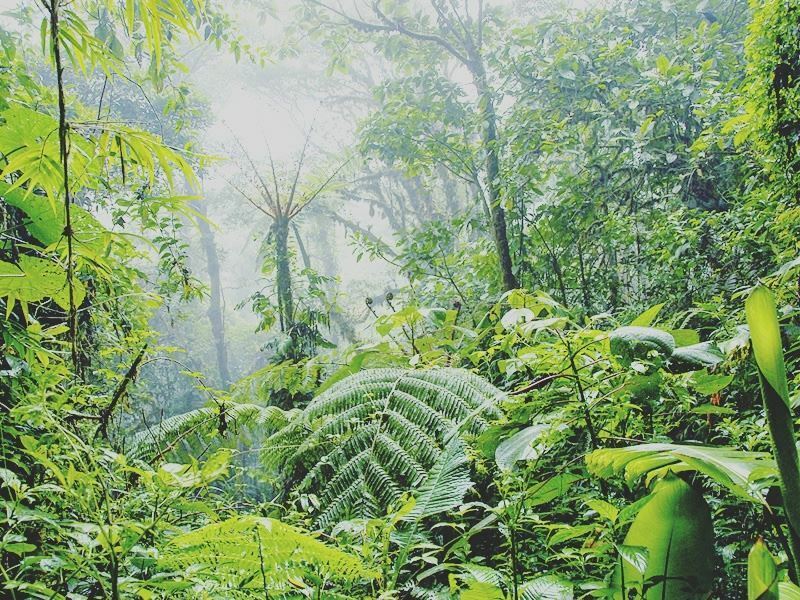 One of the main reasons Costa Rica is so beautiful is because it does get rain. Be prepared for at least a few showers at any time of year. However, if you want a bit more certainty, then December to April are the driest months on the Pacific coast and March to September on the Caribbean coast, with temperatures reaching a lovely 25°C. May, June and September are very humid. The flight time to Costa Rica is approximately 11-12 hours. There are direct flights available with British Airways from London Gatwick to San Jose and with Tui Airways from London Gatwick to Liberia. There are indirect flights from other UK airports to Costa Rica via the USA, with services provided by United Airlines and American Airlines. British passport holders do not require a visa for travel to Costa Rica. British Citizens will require a full British passport, which must be valid for six months after departure from this country. All children and infants must also hold their own passports. The official language in Costa Rica is Spanish although English is widely spoken throughout the country. Costa Rica is a relatively small country, with a good infrastructure which means it is pretty easy to get around. There are internal flights if you don’t fancy a road trip but would still like to explore more of the country. View dense jungle and volcanic peaks from up high. Driving is relatively easy in Costa Rica and with the quiet roads and fabulous scenery, a great way to get around. Admittedly, you can expect potholes and unsurfaced roads, but if you’re used to driving in the UK, you’ll be used to that! At the wheel of your own car, you can see more of the island at your own pace. Head along the coastline, explore the Central Highlands and stop off at any of the national parks. Road signage isn’t that great, so maps and sat nav are essential items. You’ll need a valid driver’s license, be over 25 years of age and to be aware that there are hefty fines for speeding offences, talking on your mobile phone and driving without a seatbelt. There are many speed traps – so, be warned. Hiring a car isn’t cheap, you can expect to pay at least $400 per week, including insurance. Pick up a car at rental offices to be found in all major towns and close to tourist attractions and drop it off at the airport on departure. There is a network of air-conditioned minibuses that connect many of Costa Rica’s main tourist attractions. Pricier than the public buses – they are, however, comfortable, faster and will also pick up and drop off at hotels. The main operator is interbusonline.com who charge between $25 and $60 for mid- to long-range journeys. A much more comfortable and reliable alternative to the public buses in Costa Rica. The cheapest way to get around Costa Rica is by bus and the capital city of San José is the central hub for most journeys. Most buses do not have air conditioning and are not known for their space or comfort. The longest journey you can do will only cost around $12.50, while most other trips by bus will cost between $4 to $6. For longer, more popular journeys, it is advisable to book in advance. Also, you will need to remember to buy your ticket for your return journey as soon as you arrive somewhere. It’s not possible to buy return tickets, so to be sure you get a seat home – don’t forget! The timings change with alarming frequency – so check ahead for travel at wthebusschedule.com/EN/cr. The official currency in Costa Rica is the Costa Rican colón (CRC). It’s a good idea to take US dollars or Costa Rican colones with you, however, you can use your debit or credit cards to withdraw money from the cash machines on arrival. Most hotels, restaurants and major tourist attractions will accept US dollars, however, you will be given your change in colones. Visa and MasterCard are widely accepted in Costa Rica. The standard voltage in Costa Rica is 120 V and the frequency is 60 Hz. A plug with two flat pins is necessary for recharging all your electrical appliances. No special vaccinations are required for travel to Costa Rica, however, you should ensure you are up to date with any routine immunisations. Speak to your GP or specialist travel clinic well before you are due to travel, to ensure your vaccines are up to date. Mosquitos are present in Costa Rica, so make sure you have plenty of repellent with you and give your feet and ankles an extra good spray if you’re out late in the afternoon and into the evening. Small festivals pop up all year round in Costa Rica. This may be a Catholic country, but the people here love an excuse for a great party, with dancing, marimba music, fireworks and some great feasts to be enjoyed. Time your stay in Costa Rica with one of these events and really immerse yourself in the local culture. The Palmares Fiestas are Costa Rica’s equivalent of Octoberfest and happen over two weeks in January. The small town of Palmares is near to the colonial town of San Ramon and plays host to this exciting celebration with concerts, a carnival, sporting events, fireworks and lots of food and drink. Just one hour from San Jose, make sure you explore the rolling hillsides and visit the Los Angeles Cloudforest Reserve while you’re in the area. Puntarenas Carnival is celebrated in March on the Pacific coast. Follow the parade, with its dancers and giant mascaradas (painted smiling heads) and dance the night away to live music from local bands. The distance from San Jose is about 80 kilometres and you can reach the port town of Puntarenas in approximately one hour and 45 minutes by road. Limón Carnival takes place each October in the town of Limón on the Caribbean coast of Costa Rica. This mini version of Brazil’s famous carnival has brightly decorated floats and colourful costumes which perfectly showcase the country’s vibrant Caribbean culture. Costa Rica has two oceans to source for fresh seafood - the Pacific and the Caribbean, so unsurprisingly, fish is a bit of speciality here. You’ll encounter cuisine which ranges from French to Chinese, especially in the hotels, but the native food is tempting and tasty too. Try Gallos, tortillas with beef, chicken or ham, a touch of spice and some mashed black beans. Ceviche is a typical dish, made from shrimp, sea bass, snapper or octopus. Soaked in lime or lemon juice, this is a good sharing dish, often served at family get-togethers and in many restaurants or by street vendors. Costa Rica’s guaro is a clear liquor distilled from sugar cane and there is also a good selection of local rums and beers available for you to try.